Chapter members celebrate the holidays in midtown Manhattan. 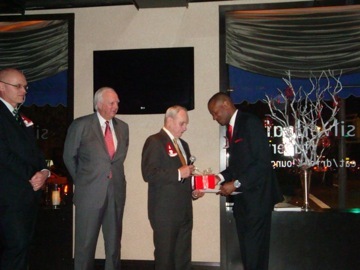 NEW YORK -- The Greater New York Chapter of the University of Alabama Alumni Association (UANYC) hosted its 2010 holiday party for the second-straight year at the Silverleaf Tavern in midtown Manhattan. Nearly 75 alumni were attendance, including several University dignitaries -- Director of Athletics Mal Moore, National Alumni Association President Eddie Hardaway, C&BA Women's Initiative Director Diane Harrison, Associate Director of Athletics Ronny Robertson and Director of Alumni Affairs Pat Whetstone. The evening's festivities were highlighted by the chapter honoring The Honorable Arthur M. Cromarty (’42) as its 2009-10 Alumnus of the Year. Cromarty graduated from Alabama in 1942 with a bachelor's degree in economics of transportation. After a decored three-year military career in the Army Air Corps where he rose the rank of Captain as a bombardier, he earned his law degree from St. John's and was admitted to the New York State Bar in 1949. Cromarty praticed law for a few years before beginnging his long and illustrious career as community and civic leader. He served the city of Babylon, N.Y., as a town councilman from 1956-57 and town supervisor from 1958-62 before being appointed vice-chairman of the New York State Thurway Authority from 1963-66 by Governor Nelson Rockefeller. His most notable accomplishments came during his 15-year tenure as District Administative Judge in Suffolk County, N.Y., from 1974-92 where he was instrumental in the improvement of many areas of clerical management, court operation and jury service while maintaining a high degree of cooperation between the courts and the county, particularly in the area of criminal justice, and managing the Suffolk courts at the lowest cost per case of all larger counties in the state. Cromarty successfully spearheaded the project of building centralized criminal court facilities in Riverhead and the Cohalan Court Complex in Central Islip. In 1996, the Suffolk County Legislature memorialized his unselfish contribution to making Suffolk County a good place to live, work, learn, play, and pray by designating the county court facilities in Riverhead as the “Arthur M. Cromarty Court Complex”. Cromarty retired from bench in June 1993 and is currently associated as counsel to the law firm of Long, Tuminello, Besso, Seligman, Werner & Sullivan, LLP, of Bay Shore, N.Y.
Huston Stewart (’00) and Scottie Rodgers ('95) received the 2010 President's Awards for outstanding dedication and service to the Greater New York Chapter. Stewart was presented the award for his tireless work as chapter president for six years from 2004-10 while Rodgers earned recognition for his work in maintaining the website and assisting in the communications efforts for the chapter as a current vice president on the president's leadership team. Several chapter members took home prizes from the silent auction, benefiting the chapter's contributions to the University’s National Alumni Association Scholarship Fund. Christopher Hollinger won a Rick Rush print, Heath Terry won a 2011 football ticket package of two game tickets, VIP access and parking for either the Arkansas or Vanderbilt game, Kristie DeKoker won two zone tickets to a 2011 home football game and Corey Gibbs won a VIP table reservation for every 2011 UANYC football game watch party and a $50 gift certificate from The Ainsworth. Silent auction and raffle items were donated by the Alabama Athletics Department, Corey Gibbs of Ticket Solutions, Inc., and Dennis Bogart of The Ainsworth and The Hill. "This year's holiday party was once again a tremendous success," said UANYC President Christopher Hollinger. "We were especially pleased to have so many honored guests to attend from the University. It was a wonderful occasion for us to celebrate the holiday season with members of the Alabama family here in the Greater New York area."